With a façade that resembles a spacecraft from an alien planet, the design concept of the National Kao­hsiung Center for the Arts was inspired by nearby groves of old banyan trees with interwoven aerial roots. 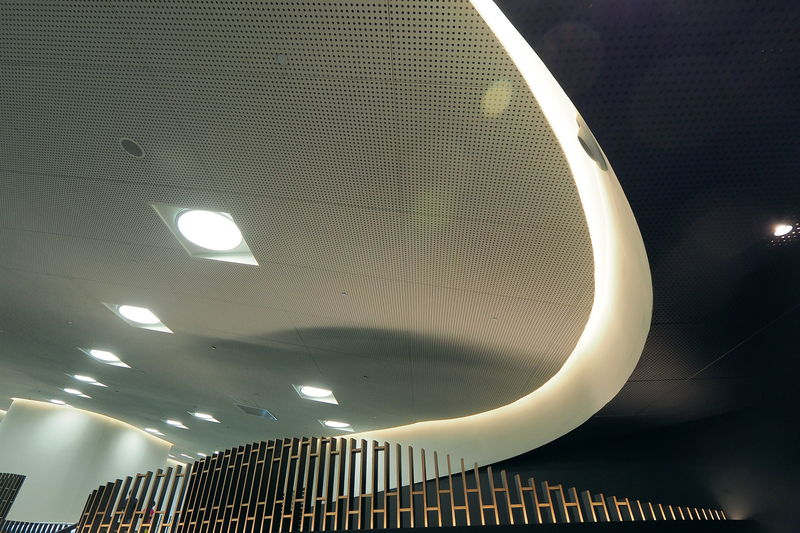 The center not only looks avant-garde, but the ambitions its management team have for the venue ­really rock too. They hope to grow a flower of performing arts in south Taiwan—once considered a cultural desert—and make their voice heard inter­nation­ally from the island’s southern tip. 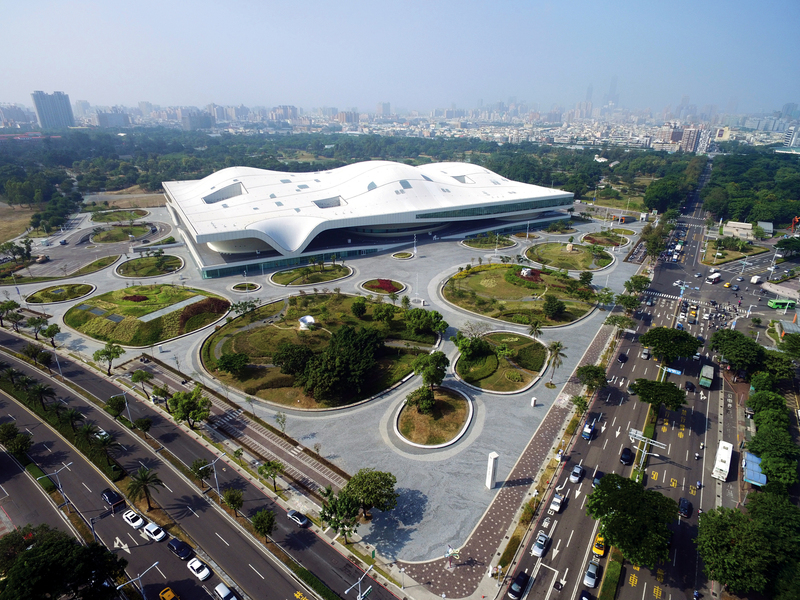 After a wait of some 15 years from planning to completion, the National Kao­hsiung Center for the Arts—aka Wei­wu­ying—opened to the public on October 15, 2018. “In fact, for us this is really an historic day. All the preparations and every­one’s energetic collabora­tion notwithstanding, the crucial thing is to make our voice heard internationally,” says Chien Wen-pin, the center’s executive and artistic director. 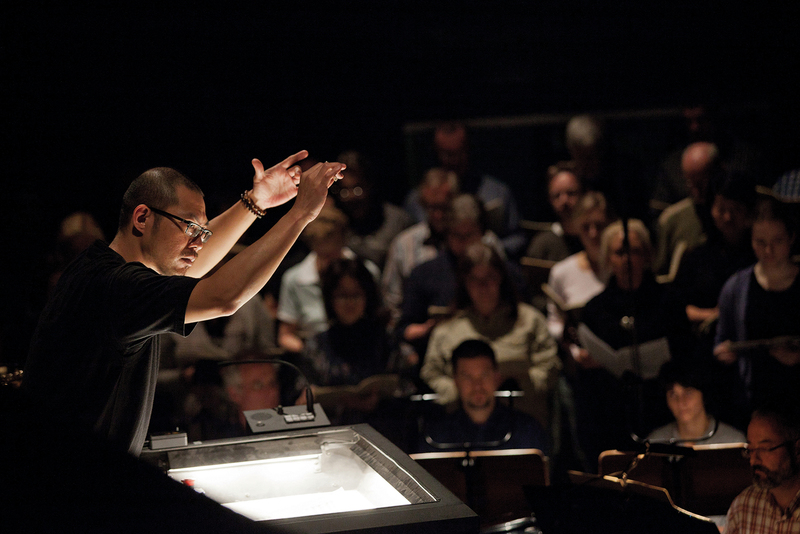 Born in 1967, ­Chien went abroad for postgraduate study when he was 22, and at the age of just 30 was designated resident conductor of the ­Deutsche Oper am ­Rhein (“German Opera on the Rhine”)—one of the first Taiwanese to conduct a top-flight European orchestra. Fourteen years later, he obtained the tenured position of conductor-­in-residence with the same body. But at 47 he resigned from this permanent post to relocate to Kao­hsiung—long dubbed a “cultural desert”—and lead the National Kao­hsiung Center for the Arts. News of the center’s grand opening has spread like wildfire throughout Europe, and to date 70-plus foreign media have covered the center. For example, “Epic Scenes: The Biggest Arts Venue on Earth Lands in Taiwan” reads the headline in Britain’s prestigious daily The Guardian. The exposure provided by this October’s opening cere­mony is not the only thing to capture global attention for the center. 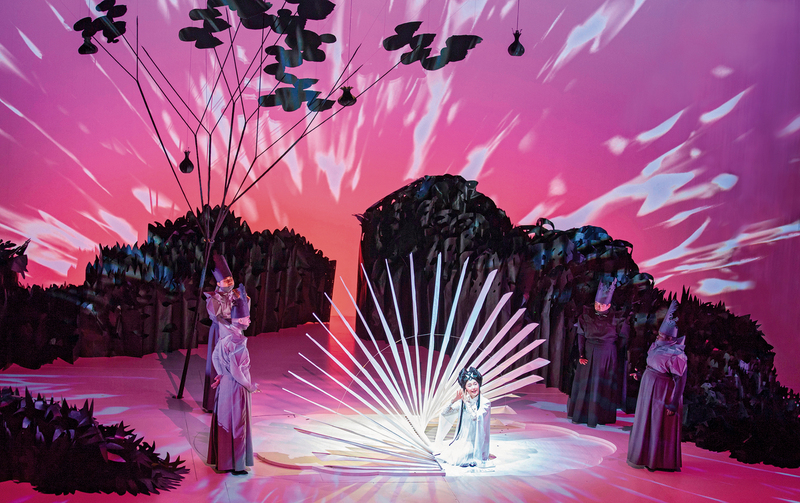 World premieres of productions of Turandot and Paradise Interrupted, international undertakings in which the center participated, took place in 2015. Inspired by 16th-century Chinese dramatist Tang ­Xianzu’s acclaimed ­Kunqu opera Peony Pavilion, the one-act Paradise Interrupted was coproduced by the National Kao­hsiung Center for the Arts, the Lincoln Center of the United States, Spoleto Festival USA and the Singapore International Fest­ival of Arts. But the behind-the-scenes production team for the Taiwan‡German coproduction of Turandot—from dir­ector Li Huan-­hsiung to costume designer Lai ­Hsuan-wu, stage designer ­Liang Jo­shan and video designer Wang Jun-jieh—are all natives of Taiwan. 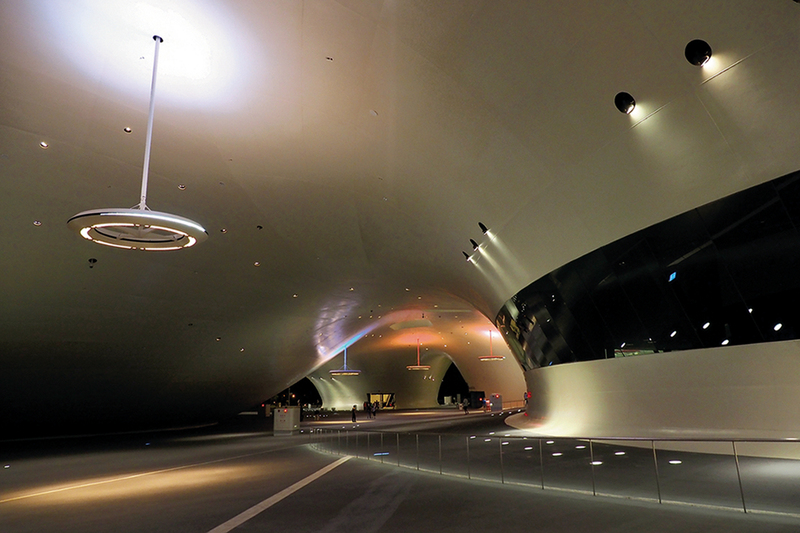 “Why can’t we nurture a performing arts style that belongs to Kao­hsiung?” he wonders. To this end, while preparing for the official opening he brainstormed with his partners. All the customary etiquette employed in a performance venue was open to discussion, including how to guide audiences in appreciating performances, the style of interaction with visitors, audience dress code, vocabulary, dialect, terms of address, and so forth. Just because something is done a certain way in Tai­pei, doesn’t mean Kao­hsiung must follow suit. As an example, he jokes about the typical Kao­hsiung motor­cyclist’s habit of directly turning left at an inter­section, instead of obediently proceeding to a “left-turn box” and awaiting a green light as Taiwan’s traffic regu­lations demand. When dealing with a Kao­­hsiung audience, there is naturally no need to make things sound complicated; the people you are serving are different, and therefore the way in which you serve them should be adjusted to a format that is genuinely appropriate for locals. “For me, this is a major creative undertaking. It’s not a matter of efficiency above all. It’s about creating a performing arts ‘ecosystem’ that is centered around Kao­hsiung,” emphasizes Chien. In 2015, ­Chien proclaimed “Every­one’s Art Center” as the center’s positioning. This slogan echoes the design concept of the center’s Dutch architect, Francine Houben. Inspired by the local banyan trees, she designed a flat roof consisting of a single undu­lating structure that resembles the canopy of a grove of the iconic trees. 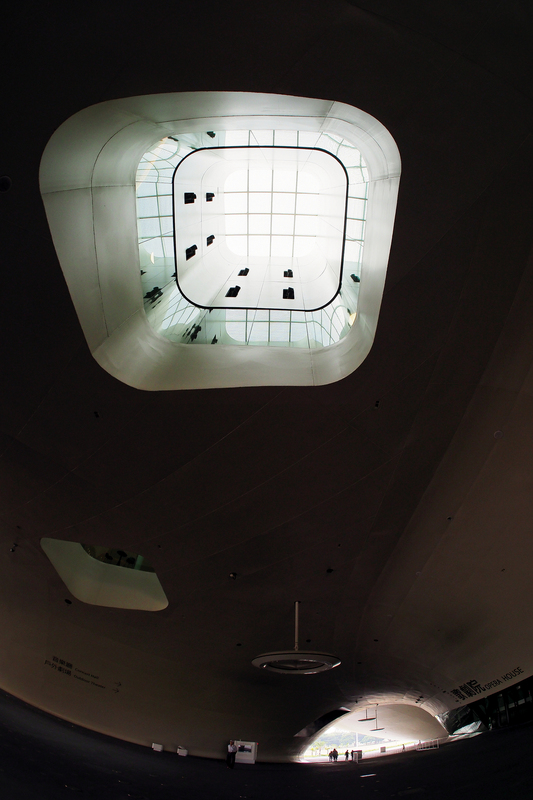 Hollow spaces formed within the interwoven aer­ial roots became passages and resting spots under the roof. Light radiates inside via skylights, mimicking the ambiance of sunlight filtering through treetops. Meanwhile, the network of linked ramps and municipal park pathways surrounding the center natur­ally channels the public into Banyan Plaza, where they can enjoy the comforts of this semi-outdoor space. Under the streamlined roof, the interior space consists of four venues: the Concert Hall, the Recital Hall, the Opera House and the Play House. The Concert Hall is the only one in Taiwan to adopt a “vineyard-­style” design, in which the performers are entirely surrounded by the audience. Berlin Philharmonic Hall, Walt Disney Concert Hall (Los Angeles), Suntory Hall (Tokyo), and Paris Philharmonic Hall all feature a similar design. As a performance venue for chamber music and recitals, to obtain optimal acoustics the walls of the Recital Hall are lined with sound-reflecting wooden panels, with sound-absorbing drapery behind rhombic openings in the panels around the upper half. The Opera House is the largest theater in Taiwan. 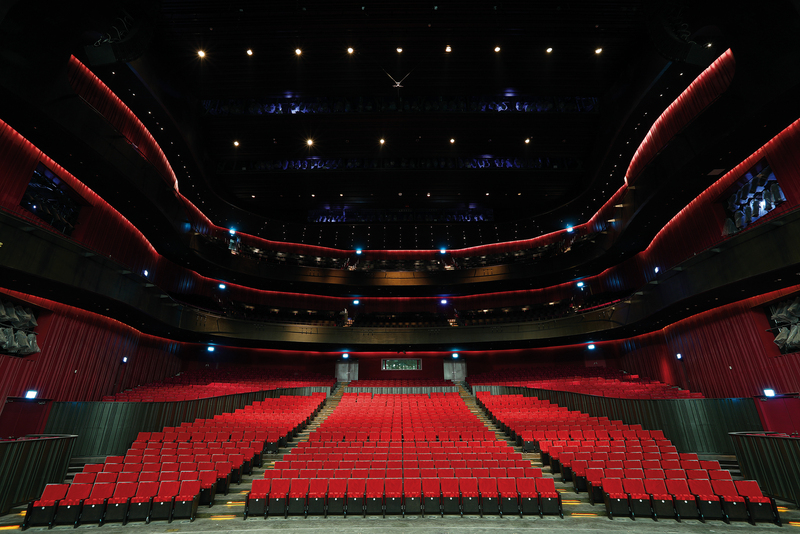 Domin­ated by the color “Taiwan Red,” the horseshoe-shaped seating layout can accommodate audiences of up to 2,260 people. The Play House is decorated mainly in Delft blue. Depending on the demands of a specific performance, the stage can be configured as a single-sided framed stage or a projecting three-sided stage. The latter positions the audience close to the performers, allowing theatergoers to experience the tension of the drama more intensely. Southern Taiwan certainly deserves to enjoy world-class performance venues, but Chien does not wish for art to be put up on a pedestal. “I hope this will become a ‘place’ where every­one likes to come, and not a ‘temple.’” So they organize activities in Banyan Plaza such as inviting people to practice yoga or for children to play on swings. 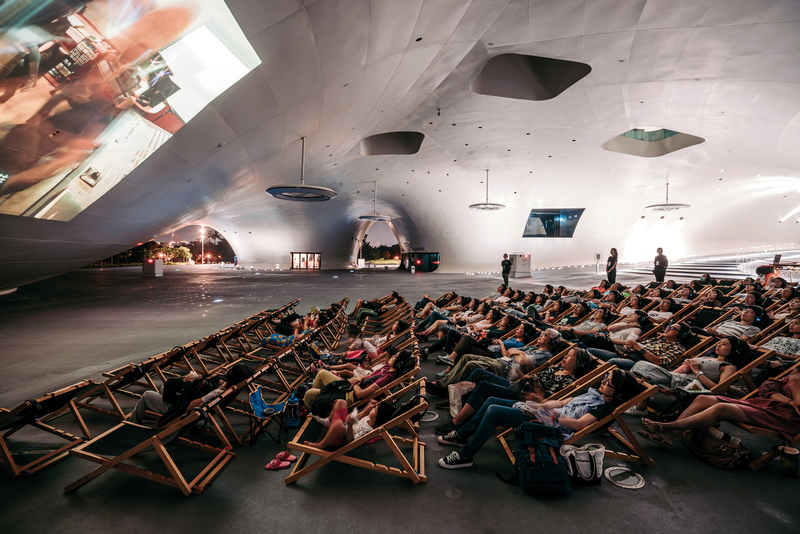 They have also organized movie screenings that allow spectators to recline casually in Banyan Plaza while watching a movie projected onto the curved steel-plate wall. While strolling in the center’s “Time Gallery,” I read the detailed history of Wei­wu­ying, and only then did I learn that this vast space served as a key military site from the Qing Dynasty through the era of Japanese rule and beyond. In 1979 the military relinquished claims to it, and in 1992 the Wei­wu­ying Metropolitan Park Promotion Association, founded by poet and physician Dr. ­Tseng Kui-hai, promoted the site’s conversion into a muni­cipal park. In 2003, the central government approved the “Weiwuying Art and Culture Center” plan, reserving ten hectares of land within the park for the art center, which was completed in 2018. As stated by President Tsai Ing-wen at the grand opening ceremony, its completion represents the fruits of efforts to strive for cultural equality and liberate space in the post-martial-law era. The center’s opening season runs for two and a half months, and the programs chosen represent the fruits of the past three years of effort by the management team at the Wei­wu­ying preparatory office. Since 2015, the Kao­hsiung City Government has staged the Kao­hsiung Spring Arts Festival in the first half of each year, while the Wei­wu­ying team has organ­ized the Wei­wu­ying Children’s Festival and the Wei­wu­ying Arts Festival in the latter half of each year. Kao­hsiung’s art and culture audience has been gradually nurtured. Especially worth mentioning are the Wei­wu­ying Circus Platform and the Taiwan Dance Platform, both inaugur­ated in 2016. 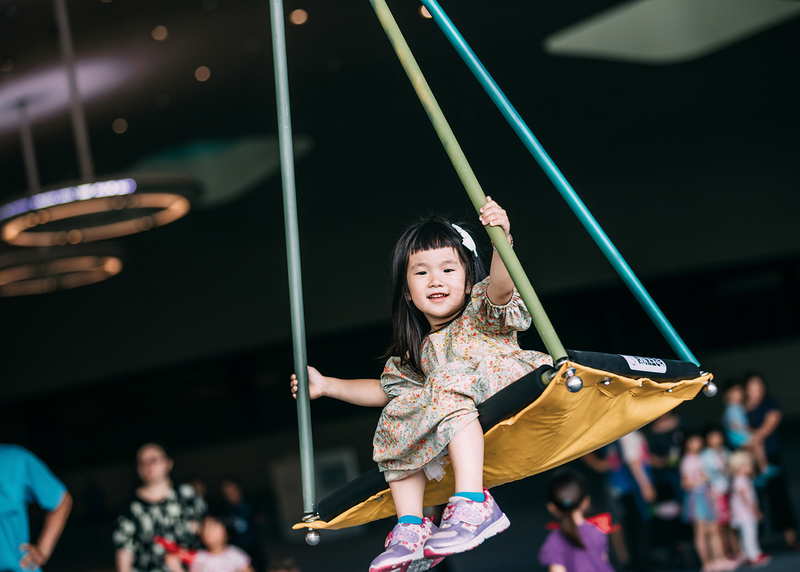 The annual circus platform is a venue where circus performers can interact. The Taiwan Dance Platform has also entered into a partnership with Aerowaves, a European networking platform for young choreo­graphers, thereby becoming the first organization in Asia to formalize col­labora­tion with that body. If a musical metaphor can be used to describe the center, ­Chien doesn’t hesitate to put it like this: “Of course, it’s a symphony!” All kinds of musical instruments have their place in a symphonic composition, just like the center’s stage exists for all sorts of people. Each person can find his or her own place here.